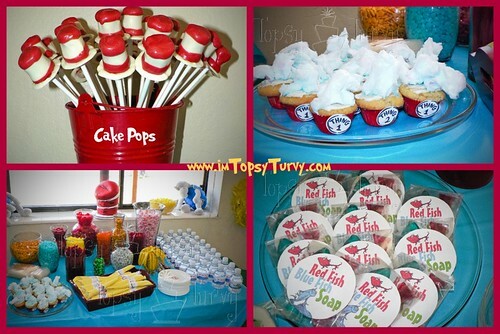 Ashlee, of the blog I'm Topsy Turvy, created this splendiferous Dr. Seuss Party for her daughter. Take a look at the amazing decorations, treats, games and favors she made. 1. The amazing Cat in the Hat cake made out of fondant that nobody realized was a cake. For more details on how she created everything, go to I'm Topsy Turvey's blog. ObSEUSSed is searching for Dr. Seuss related blog posts to add to my Dr. Seuss collection and to create a place for all Dr. Seuss fans to gather their ideas. If you have a Dr. Seuss activity, lesson plan, craft, nursery / room decor or party posted online, please add it to one of the ObSEUSSed link collections on the tabs at the top of this page. Go to the Seuss Celebrations page where this party is linked. What a cute party! My daughter would love this, thanks for sharing these ideas. You've got such a cute blog. We are big reading/dr. 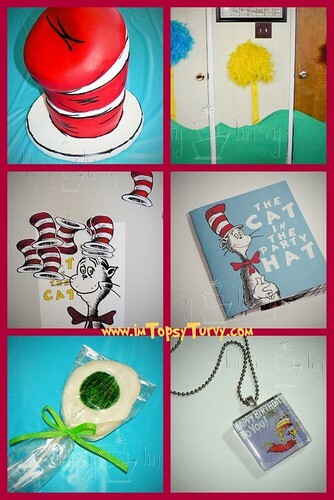 seuss lovers here! Oh my, your imagination is suessical! Love it. Sending details to my daughter... I think, she will love this! Creative as she be, this might just be too cool! Thanks for the link of I'm Topsy Turvy blog. I was able to get the theme of Dr. Seuss! I also added customized pens to prizes and party souvenirs for my daughter's birthday.